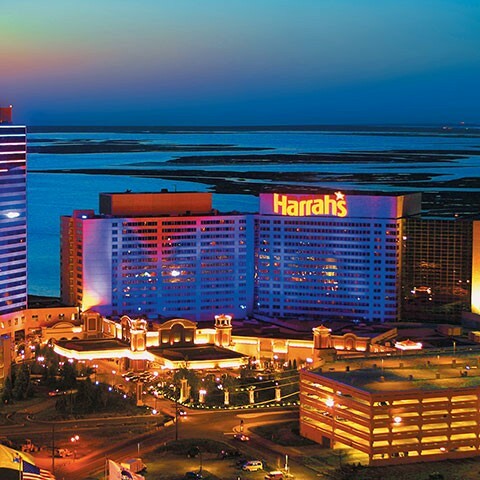 With its sophisticated marina setting and infinite roster of world-class resort amenities, Harrah’s Resort has become the premier Atlantic City destination, boasting the tallest hotel tower and so much nonstop action you’ll never want to leave. Stay in one of 2,000 plush room and suites, enjoying waterfront views. Indulge in the Elizabeth Arden Red Door Spa, relax at the perfect outdoor oasis, The Pool by day and enjoy the hottest club scene at night, shop and dine with 12 restaurants and the Waterfront Shops. Home to “The Pool After Dark” a premier Atlantic City nightclub experience, with world class DJs in a wet and wild party atmosphere. Let It Ride, Craps, Big Six, Pai Gow Poker, Caribbean Stud and much more! A unique spa experience awaits you at Harrah’s Elizabeth Arden Red Door Spa in Atlantic City. Elizabeth Arden Red Door Spa offers Harrah’s Resort Atlantic City spa guests a wide selection of massages. Facials at the Red Door Spa are elevated treatments that promise exceptional results. Wraps, scrubs and airbrush tanning are some of the exotic body treatments offered at Harrah’s Resort Atlantic City. If you love to cook, entertain, or just appreciate the pleasure of great food, the Viking Cooking School at Harrah’s Resort Atlantic City is the place to indulge your passions. The Viking Cooking School is something you just have to see. It combines a hands-on teaching kitchen and a gourmet toy store full of the finest culinary tools available. Take a class by yourself or with your friends and savor fun times followed by a great meal. Browse the retail store and pick up cookware and cutlery, countertop electrics, and much more.